It can be harder to get kids outside these days with so many exciting things inside like the internet and computer games. But giving them tasks and games to play in the garden is a sure bet. Now is the time to take advantage of our, sporadic, summer days and here are some fun ways to involve your kids in your garden life. This gardening task will help teach kids about the importance of recycling as well as being a fun activity. These can be hanging planters or stand upright, so make the choice before you cut the bottles. Carefully cut your bottle in half, then take the cap off and cover the bottle mouth with some muslin cloth. Fill this half of the bottle with dirt about halfway and place your chosen plant on top. Fill the bottom half on the bottle with water and then place the top half in so the bottle mouth rests in the water and can drink away as needed. Hanging bottles will work well for tomato plants, just push your plant start through the open mouth and top up the bottle with potting soil. For this you’ll need four lengths of string, a clean glass jar and a piece of cotton wool. Tie each string around the neck of the Jar and tie four knots opposite each other. Next turn the jar upside down and take one string and tie it about half way down to the string adjacent to it. Repeat with all four. Then repeat again, making sure the knots are now near the base of the jar so it’s made a kind of diamond-shaped string basket. Puncture a hole in the lid to feed the cotton ball though, fill jar with sugar water, secure the lid and hang the jar upside down in your garden. Wait for your beautiful butterflies. 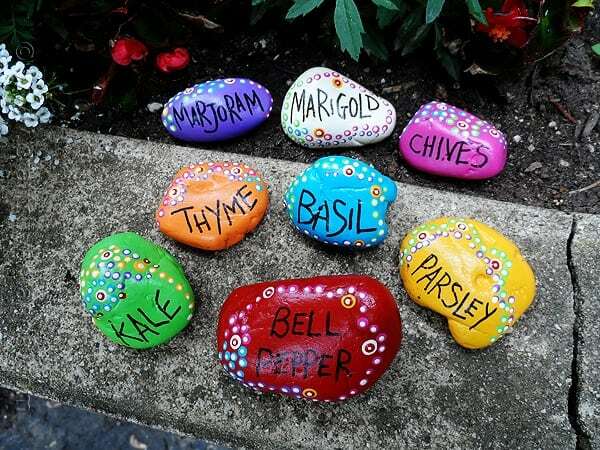 Garden markers are a handy way to label your plants and particularly good for rows of vegetables that you may not recognize straight away as they grow. Getting the kids involved in this project is a fun way to help them feel useful and involve them in your hobby. Choose a batch of good-sized flat and smooth stones from the beach or park and let the kids at them with acrylic paint. They can make them represent the plant they are marking, they could paint the name of the plant on the stone or they could just get creative – but you’ll need some kind of code so you can identify the plants. Finally, coat the stones in varnish and leave to dry before putting out. Perfect for a sunny day to get the kids active and playing outside and you get to water the grass at the same time. It couldn’t be simpler. Take an empty 2 litre plastic bottle and make a series of holes in the bottle with a pin or thumbtack. Repeat until you have a series of rows around one half of the bottle. Then tape the garden hose into the bottle neck and turn on the water at a low pressure. Once the bottle if full it should kick into action. It’s not the slickest of water sprinklers but the kids will have fun and it’s only temporary. When the weather is warm and you want to spend time in your garden, you may also worry about the kids spending too much time in the sun. A garden tent will give them some much-needed shade and a fun place to relax. They can help you make it too. Simply string a piece of rope tightly between two trees or two poles about 3m apart and 1.5m off the ground. Secure a sheet either side with the main length of each sheet hanging down on opposite sides. Pull each sheet out and secure down with pegs or rocks. Fill the inside with cushions and blankets and enjoy your sunny afternoon. Wind chimes are a lovely addition to any garden and the more rustic the better. Let your kids choose a selection of sticks roughly the same size then sand them down with some sandpaper. Coat each stick in different colour acrylic paint and finish with a coat of varnish. Once dry, twist in some screw-eyes or hooks into each stick and tie a piece of string to the end. Then fasten each string to a low branch outside and enjoy the music. Not all kids will enjoy this one but some will relish the chance to go bug hunting. Let them help you protect your plants by inspecting the leaves of your prized plants and vegetable for slugs and snails. Make it an expedition with a bowl to collect them, gloves to protect tiny hands and hats, because all explorers wear hats.